With the U.S. Presidential election only days away, and both parties not shy about bringing up their fondness for Ronald Reagan, it seemed an appropriate time to talk about The Great Communicator. Thankfully, this post has nothing to do with politics, and everything to do with marriage. 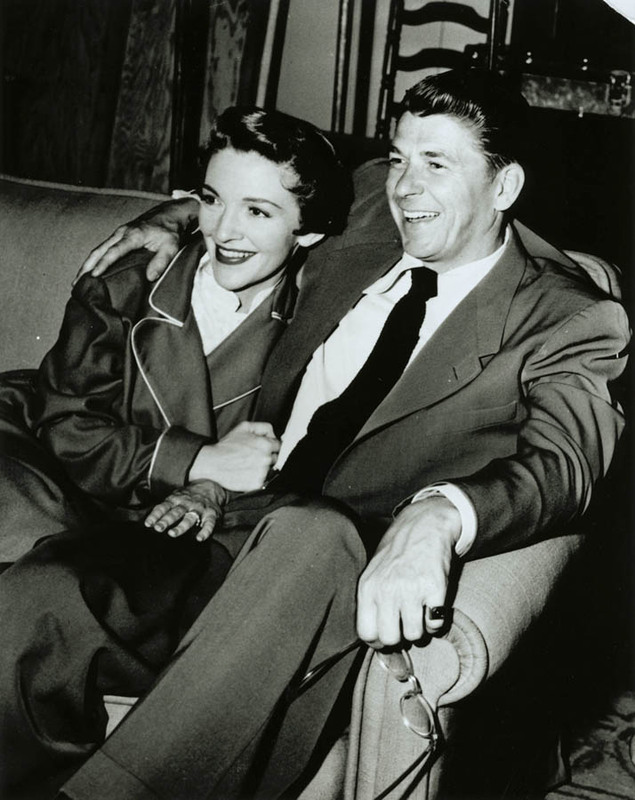 Ronnie, as she affectionately called him, wore his heart on his sleeve where Nancy was concerned, and wrote almost daily affirmations to her wherever he was. His heartfelt notes are a lasting legacy, especially to his wife. They were a reminder of his love after Alzheimer’s disease prevented him from communicating it as he so eloquently did, and of course are a great remembrance for her after his death in 2004. In our throwaway era of fast communication, Nancy says it’s “all too easy never to find the time to write letters,” calling this a great pity. She decided to share his letters to allow others to see how wonderful it can be to express what you feel to those you love. Sometimes he used silly pet names like Nancy Poo, Nancy Pants, Mommie or Career Girl, and other times he used formal names like First Lady or Mrs. Reagan. He signed them also with personal nicknames (Pauvre Petite Papa) or more formal names (The Guv, Mr. President). But he seemed to always view these terms with endearment and a twinkle in his eye. For example, on leaving the Governor’s office, he said, “’Lame duck’ or ‘ex’ you are still my first lady—now more than ever.” Tip: Use personal terms that will make your spouse smile. He varied the length and format of his letters from writing a note in a greeting card (which he frequently gave) to scribbling a note with a doodle or writing a long note on White House stationery. He often used hotel stationery, and there are examples from The Plaza Hotel in New York to Plankington House in Milwaukee. Tip: As you look back, writing on a postcard or hotel letterhead can convey the memories from trips or places you lived. His notes were nearly all hand written, except when sent by telegram. Texts and emails written with heart are certainly welcome today, but try to make the three special notes for this season hand written. Tip: Even if your handwriting is messy, write your special notes by hand. Some letters included literary references. For example, “Browning I’m not, but believe me I do love you to the breadth and depth of all my being…” You might think it sounds cheesy, but I bet Nancy liked it. I was more impressed by his reference to Anne of Green Gables, although he misspelled her name. “Just think: I’ve discovered I can be fond of Ann Blyth because she and her Dr. seem to have found something of what we have.” Tip: Use songs or books or movies that mean something to the two of you, especially if you have a hard time coming up with romantic language on your own. He sometimes included a gift, and often included a funny note or explanation. Tip: It can be a small treat or something more extravagant, but a gift accompanied by a note is always fun. He sometimes included personal memories or stories of their early days. Tip: Sharing personal memories helps bring back the memories and feelings of those passionate days. He was constantly telling Nancy how much he loved her, adored her, missed her, and needed her. Do you think she ever got tired of it? Here’s one example: “I’ve always loved and missed you, but never has it been such an actual ache…I’m all hollow without you.” Tip: Don’t be afraid to share your feelings. Work hard to express your love. He never missed a special note for Valentine’s Day, anniversary, Christmas, birthdays, Mother’s Day, etc. He sometimes treated ordinary days like a holiday, and holidays like an every day. For example, on their March anniversary in 1963, he wrote, “This is really just an ‘in between’ day. It is a day on which I love you 365 days more than I did a year ago and 365 days less than I will a year from now. But I wonder how I lived at all for all the 365s before I met you. All my love, Your Husband.” Tip: Any day is a great day to give a note. Try to take a little extra care on special days. Tip: Sometimes saying I’m sorry in a letter allows your apology to sink in. And the other words of love and affirmation can’t hurt. He often shared with her his daily frustrations of work or being separated, just daily details and things that upset him. Tip: Sharing these frustrations and letting your spouse into your life and thoughts can help keep you feeling close. He sometimes played with words or used analogies. He referred to their wedding day as the day he received a heart transplant. And he often expressed surprise at how the happy years have flown by. “Others would have you believe we’ve been married 20 years. 20 minutes maybe—but never 20 years. It is a known fact that a human cannot sustain the high level of happiness I feel for more than a few minutes—and my happiness keeps on increasing.” Tip: Use language in different ways, or use a play on words. Instead of roaming the malls for the perfect gift, spend a little time remembering the days when you first fell in love. Share your feelings from the early days and from today. Repeat regularly. What tips do you think you will use for your next love letter? This entry was posted in Books, Communication, Happiness, Love, Marriage, Research and tagged best gift ideas, better marriage, Communication, love letter, love letters, marriage tips, Ronald Reagan, tips for love letters. Bookmark the permalink. I just love this one! I have heard about this side of our President, but have never had the chance to look into it. It just shows you that no matter how busy you are, even if you’re the president, there are times for little notes to say I love you. I will start using these today!!!! Glad you found it useful. I agree, the President could certainly say he didn’t have time but he always made the time for his wife and wasn’t afraid to share his heart. Best to you both. Wow Lori! This was such a wonderful post to read this morning. I’ve written my beautiful wife Alisa many times in the past and yet I need to be more like Ronnie. Writing love letters to her not because there is a big occasion, but because I love her. One thing that is making it easier for me is Send Out Cards. I know you say hand write a card, but the biggest problem for me is picking out the card. With SOC there are 1000’s to choose from and it’s really easy. Anyway, going to write more often and also to drop hand written notes where she can find them. I think you’re right that starting with a purchased card is easier for many people. The important thing is trying to sincerely communicate love and appreciation. It’s nice to have examples from a Great Communicator!